• Thermal processing: Dispersion dryers for continuous slurry drying of high moisture materials, paddle dryers for wet cake drying, and fluid bed dryers and reactors to meet low-moisture (PPM) final product requirements. • Agglomeration: Our wide-range of agglomeration equipment can be customized to your process needs for powder compacting and producing agglomerate suitable for rapid dissolution. • Mixing: Whether you need single-step batch technology or a continuous processing system, we can design industrial processing equipment to mix multiple wet and dry components in a single step. 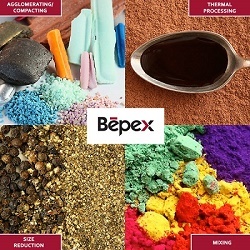 • Size reduction: From coarse to fine particles, Bepex size reduction equipment can be tailored to your industrial process for optimized performance and value. Our process development center offers bench type feasibility studies, single and multi-unit system testing, and small-scale production for market tests. Call us to schedule your material analysis.